The latest version of EasyConverter Express enables any company, charity, public body or education establishment to create altformat documents for clients, staff or students. With one tool, organisations can fulfill their legal requirements and promote inclusivity in the workplace. For schools, colleges and universities it is essential to make the curriculum accessible to the widest number of students. In addition, by offering alternative formats to communicate, a company will improve customer service, client retention and staff motivation. EasyConverter Express is an essential toolkit for organisations to create a wide range of accessible documentation in-house using Word, without the expense of outsourcing translations. Providing documents in braille, large print, MP3 and text-only ePub format will suit the needs of many individuals with sight loss and reading difficulties. 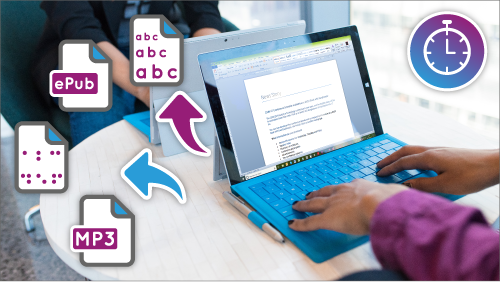 Crucially, EasyConverter Express is affordable, quick and simple to use, so with minimum investment staff are empowered to confidently deliver alternate format Word documentation on demand and as standard. EasyConverter Express is available in multiple territories with support for LibLouis braille tables and also supports mobile reading. If you are a company, charity or public body, find out more and download a FREE 30-day trial EasyConverter Express for organisations. If you are a school, college or university, find out more and download a FREE 30-day trial EasyConverter Express for education. You can also compare EasyConverter editions.